Serena Williams' US Open outburst was by no means the first we have seen on sport's grandest stage. 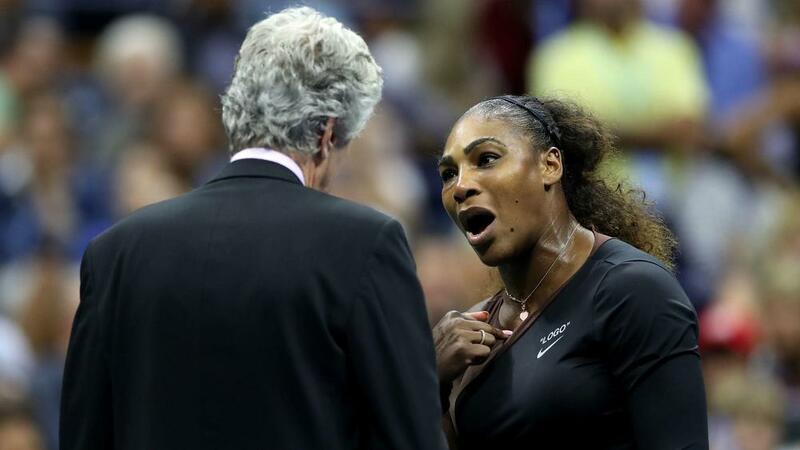 The 23-time grand slam champion stunned the watching world on Saturday by branding chair umpire Carlos Ramos a "liar" and a "thief" amid a series of code violations during the women's singles final against Naomi Osaka. Williams' comments eventually landed her with a game penalty, which ultimately gave Osaka the chance to serve out for a 6-2 6-4 triumph and a first major title. During the post-match presentation, the Flushing Meadows crowd made its feelings on Williams' treatment perfectly clear with a series of boos, although many have subsequently argued that Ramos was simply following the letter of the law after handing the home favourite a first-set warning for what he believed to be on-court coaching. Williams' rant at Ramos is far from the first at a tennis major. During the first round of Wimbledon in 1981, McEnroe became enraged by umpire Edward James' decision to call his serve out. "Excuse me? ", began McEnroe, who went on to utter the immortal words "You cannot be serious!" That setback did not prove much more than a bump in the road, however, as a 22-year-old McEnroe went on to lift his maiden Wimbledon crown - the first of three titles in four years at the All England Club. England captain Gatting was penalised by umpire Shakoor Rana as he adjusted the field in the final over of the second day and, after a series of contentious decisions, Gatting had had enough. He remonstrated angrily with the official, repeatedly pointing his finger, and had to be dragged away from the argument. Rana successfully demanded a written apology the next day before resuming the match. Arguably the most scandalous entry on this list. Having lost the WBA heavyweight crown to Evander Holyfield in November 1996, Tyson was hyped up for the rematch seven months later. But the red mist descended as early as the third round, when Tyson was sensationally disqualified for biting off a part of Holyfield's ear. Tyson was subsequently fined $3million and his boxing licence was rescinded and only restored over a year later. One of the greatest players to ever pull on a pair of football boots bid farewell to the game in astonishing circumstances. Having given France the lead against Italy with an ice-cool Panenka penalty, Zidane had seen his side pegged back by Marco Materazzi's equaliser. And in the first half of extra-time, the Italy defender aimed a few choice words in the direction of Zidane, who turned and planted his head into the chest of his opponent. Referee Horacio Elizondo had little choice but to show a straight red card, before France went on to lose in the shoot-out. This was a shocking display of violence by Wigan Warriors prop Flower. In the opening couple of minutes at Old Trafford, Flower reacted to being caught by St Helens' Lance Hohaia by punching his opponent in the face. With Hohaia already unconscious on the floor, Flower then delivered another blow in a sickening show of aggression. Referee Phil Bentham sent Flower from the field and, after St Helens triumphed 14-6, the Wigan man was banned for six months.